The production train has 375 wagons, improving on Transnet’s previous world record of the 342-wagon iron ore production train. The employees of Transnet Freight Rail (TFR) had every reason to celebrate this week after successfully launching a 375-wagon manganese train, which measures 4km in length – breaking the record of testing the longest production train in the world. According to TFR spokesperson Mike Asefovitz, the testing of the train took place over a distance of about 861km – from Sishen in the Northern Cape to Saldanha, the Western Cape. It is meant to meet the needs of manganese customers within the Hotazel area in the Northern Cape and the emerging miners. Russell Baatjies, general manager for iron ore and manganese business unit at TFR, said the project team was “challenged to explore the use of technology through industry 4.0 solutions, to achieve the same objective at minimum cost”. “Applying distributed power technology to increase the train length to 375 wagons will reduce capital requirements by over 90% of the initial estimate,” he said. TFR general manager Brian Monakali, and chairperson of International Heavy Haul Association, said: “This is another breakthrough for the heavy haul railway industry. 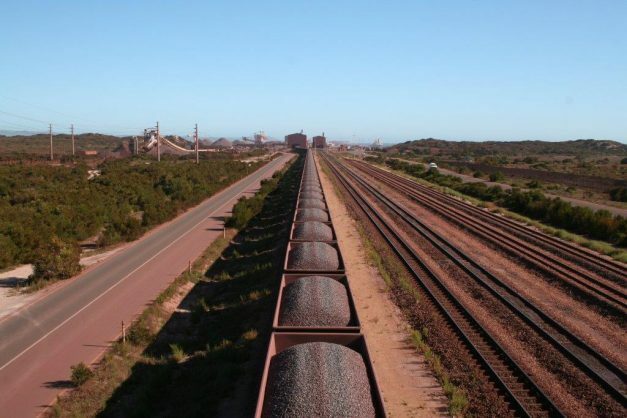 Rio Tinto in Australia recently started with implementation of driverless trains in their iron ore railway system.